Recent popes have highlighted the necessity of caring for the environment—but how does what they say differ from secular environmentalism? This “culture of waste” tends to become a common mentality that infects everyone. Human life, the person, are no longer seen as a primary value to be respected and safeguarded, especially if they are poor or disabled, if they are not yet useful—like the unborn child—or are no longer of any use—like the elderly person. Pope Francis’s concern about the environment is not novel: Venerable Paul VI reflected on the topic in Octogesima Adveniens (no. 21), his 1971 apostolic letter on the 80th anniversary of Pope Leo’s XIII’s landmark social encyclical Rerum Novarum. Early in his pontificate, in his 1979 apostolic letter Inter Sanctos, Blessed John Paul II proclaimed St. Francis of Assisi the heavenly patron of those who promote ecology. At various points in his pontificate, John Paul directed his attention to ecological concerns, most significantly in his 1987 encyclical Sollicitudo Rei Socialis (nos. 26, 34), his 1990 Message for the World Day of Peace, and his 1991 encyclical Centesimus Annus (nos. 37-40), in which he linked the environment to a “human ecology” whose “first and fundamental structure” is “the family founded on marriage” (no. 39). It was Pope Benedict, however, who earned the nickname “the green pope,” in part because of the installation of solar panels above some Vatican buildings and in part because of the Vatican’s attempt, which proved ill-fated, to become the world’s first carbon-neutral nation. concern and commitment for the environment should be situated within the larger framework of the great challenges now facing mankind. If we wish to build true peace, how can we separate, or even set at odds, the protection of the environment and the protection of human life, including the life of the unborn? It is in man’s respect for himself that his sense of responsibility for creation is shown. In November, the United States Conference of Catholic Bishops cosponsored “A Catholic Consultation on Environmental Justice and Climate Change: Assessing Pope Benedict XVI’s Ecological Vision for the Catholic Church in the United States.” Much of the conference, which was held at Catholic University in Washington, has been posted on YouTube. “The paper focused especially on fresh water in an era of climate change. These insights require that industrialized nations such as the United States fulfill various duties but, too often, such duties are unpalatable in the American context,” Peppard told CWR. 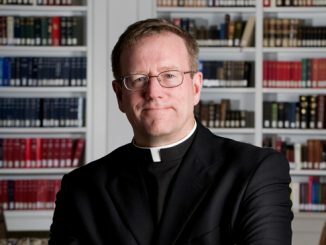 CWR asked scholars who spoke at the conference, as well as other Catholic writers who have reflected on papal environmental teaching, several questions, including: what are the most important ways in which Catholic teaching on the environment challenges, and even calls to conversion, the typical Catholic in the United States today? How, in their judgment, does Catholic teaching converge with, and diverge from, the concerns of the contemporary environmental movement in wealthy nations? And what are some practical steps that a Catholics in wealthier nations can take as they seek to heed Catholic teaching on the environment? our Catholic faith challenges us to think of how our actions, choices, and lifestyles affect our brothers and sisters at home and around the world. The earth is our home, and we are called to care for God’s creation by living more simply, using the earth’s resources wisely, and reducing our consumption and impact on the environment. Intuitively, we know that if we are taking care of our planet, our home, we are taking care of ourselves. We are also called to lift up the voice of the voiceless and to advocate for public policies that protect the environment and the human family, especially the least among us. Papal teaching on the environment, says Andrew Casad, director of the Office for Liturgy of the Archdiocese of Seattle and a writer on environmental issues, also challenges Catholics to be more grateful. While similar in some ways to the concerns of the contemporary environmental movement, papal reflections on the environment differ both in their substance and in their philosophical presuppositions. 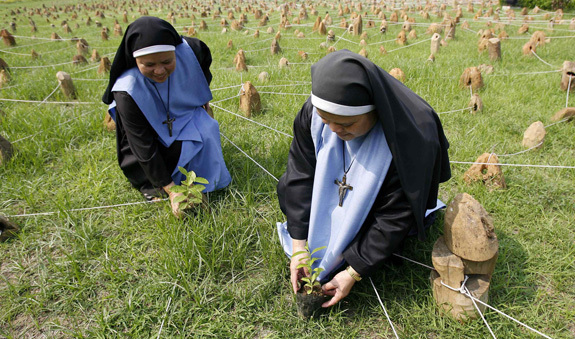 Like our secular counterparts, Catholic ecologists proclaim that humans must practice self-control to curb our environmental impacts. What Catholics add is that this need for self-control is also central to matters of human reproduction and sexuality—this latter self-control is what we call the virtue of chastity. All people can, with the grace of God, freely adopt virtuous, chaste lifestyles that control our consumption of resources as well as control our sexual instincts. Any call to suppress the human population through artificial means or through murder assumes that people are incapable of controlling their desires, of living virtuously. “Pope Benedict himself saw the environment as a key issue for the new evangelization in Europe, because environmentalists acknowledge something larger than themselves, which they need to serve and protect,” notes Cloutier. Michael Baur, director of the Natural Law Colloquium at Fordham University, observes differences in philosophical approaches between Pope Benedict and some contemporary environmentalists. It is ironic that those who voice concern about the effects of herbicides on frog reproduction often sterilize themselves through various forms of contraception. In developed countries, the population size does not pose a direct threat to the well-being of other humans in the area and in virtually all developed countries it has leveled off. The environmental problems population poses in these countries are rooted in habits of consumption and greed, along with the failure to alleviate poverty worldwide (poverty often results in poor utilization of the goods of the earth). Individuals in developed countries too often take more than their fair share of the earth’s resources and fail to maintain soil, water, and air needed by future generations. They do not need to reduce the size of their population, but rather to exercise the virtues of moderation, self-discipline, simplicity, generosity, and prudence. J. J. Ziegler writes from North Carolina.